Designed for EMI/RFI shielding applications - using conductive plastic (a compound of plastic and stainless steel fibers). For shielding effectiveness reports see "recommended reading" section below. 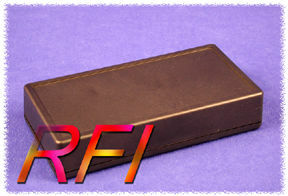 Attractively styled and ergonomically designed for use as a “hand-held” instrument enclosure. Molded from a compound of stainless steel fibers and flame retardant ABS plastic (material carries a UL flammability rating of 94V-0). Recessed top for membrane display or pad. Lap joint construction provides protection against dust accumulation and splashing water. Extra deep top and ultra shallow base are specifically designed to enhance the aesthetics of the enclosure and provide the user with flexibility and assembly efficiency. NOTE: Material is brittle - acts like phenolic - NOT FOR HIGH IMPACT USE. 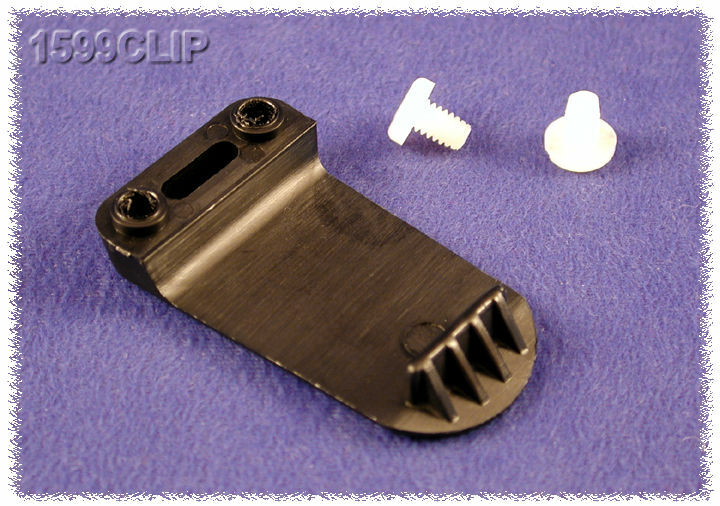 Lid is secured with Philips machine screws, threaded into tapped integral brass bushings. Perfect for applications with repetitive assembly and disassembly are required. Link here to photo tables of each part number (No Battery Door). Material is brittle - acts like phenolic - NOT FOR HIGH IMPACT USE. Conductive plastic is NOT an insulator - these enclosures must be treated like a metal enclosure. Conductive plastic will act as a heating element - any significant current flow will cause the plastic to heat and produce smoke. Designed for our battery door enclosure (ie...part numbers ending in BAT). 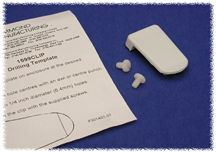 Kits include all the parts required to install the battery or batteries. Kit includes the battery holder, wires, divider and foam anti-rattle pad. Grey ABS plastic panel barriers which insert vertically into the P.C. card guides.